Tissot – Official Timekeeper of the Championship RBS 6 Nations! Tissot watch company became the official timekeeper of the Championship Rugby RBS 6 Nations for the next three seasons – from 2013 to 2015. Under the agreement, the duties Tissot include preparation and implementation of broadcast of the match, the implementation of the timing and execution of events in collaboration with the television companies showing championship game. As part of the partnership agreement online RBS 6 Nations will gadget Tissot countdown time. Thus, fans of rugby, visit the official page of RBS 6 Nations, will be able to know how much time is left before the first match of the Championship. 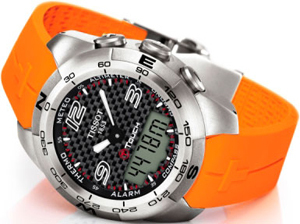 Match referee during the game will enjoy the tactile timepiece Tissot T-Touch Expert.